Born: Charles Rollin, 1661, Paris; Walter Savage Lander, 1775; Charles Lord Metcalfe, 1785. Died: William Chillingworth, 1644; King Charles I, 1649; Dr. John Robison, mechanical philosopher, 1805. Feast Day: St. Barsimaeus, bishop and martyr, 2nd century. St. Martina, virgin and martyr, 3rd century. St. Aldegondes, virgin and abbess, 660. St. Bathildes, queen of France, 680. Though the anniversary of the execution of Charles I is very justly no longer celebrated with religious ceremonies in England, one can scarcely on any occasion allow the day to pass without a feeling of pathetic interest in the subject. The meek behaviour of the King in his latter days, his tender interviews with his little children when parting with them for ever, the insults he bore so well, his calmness at the last on the scaffold, combine to make us think leniently of his arbitrary rule, his high-handed proceedings with Nonconformists, and even his falseness towards the various opposing parties he had to deal with. When we further take into account the piety of his meditations as exhibited in the Eikon Basilike, we can scarcely wonder that a very large proportion of the people of England, of his own generation, regarded him as a kind of martyr, and cherished his memory with the most affectionate regard. Of the highly inexpedient nature of the action, it is of no use to speak, as its consequences in causing retaliation and creating a reaction for arbitrary rule, are only too notorious. 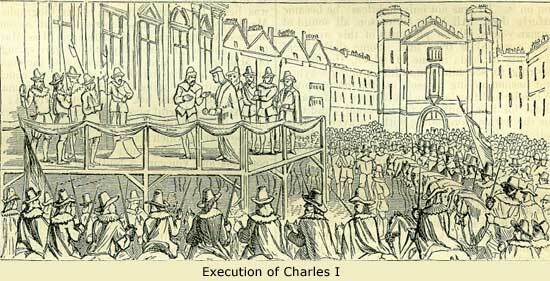 Charles was put to death upon a scaffold raised in front of the Banqueting House, Whitehall. There is reason to believe that he was conducted to this sad stage through a window, from which the frame had been taken out, at the north extremity of the building near the gate. It was not so much elevated above the street, but that he could hear people weeping and praying for him below. A view of the dismal scene was taken at the time, engraved, and published in Holland, and of this a transcript is here presented. 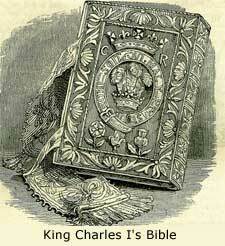 It will be observed that the cover of the Bible is decorated with the badge of the Principality within the Garter, surmounted by a royal coronet (in silver gilt), enclosed by an embroidered border; the initial P. being apparently altered to an R., and the badges of the Rose and Thistle upon a ground of blue velvet: the book was, therefore, bound between the death of Prince Henry, in 1612, and the accession of Charles to the throne in 1625, when such a coronet would be no longer used by him. If the Bible here represented be that referred to by Herbert, the circumstance of Bishop Juxon becoming the possessor of it might be accounted for by supposing that it was placed in his hands to be transmitted to Charles II, with the George of the Order of the Garter belonging to the late King, well known to have been given to that prelate upon the scaffold. The Bible was, when Mr. Roach Smith wrote the above details in his Collectanea Antiqua, in the possession of James Skene, Esq, of Rubislaw. 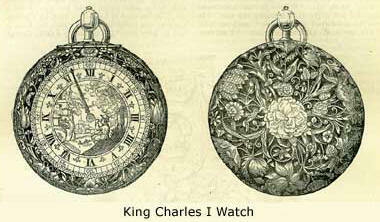 Next is engraved the silver clock-watch, which had long been used by King Charles, and was given by him to Sir Thomas Herbert, on the morning of his execution. The face is beautifully engraved; and the back and rim are elaborately chased, and pierced with foliage and scroll-work. It has descended as an heirloom to William Townley Mitford, Esq. ; and from its undoubted genuineness must be considered as one of the most interesting relics of the monarch. The body of the unfortunate King was embalmed immediately after the execution, and taken to Windsor to be interred. A smallgroup of his friends, including his relative the Duke of Richmond, was permitted by Parliament to conduct a funeral which should not cost above five hundred pounds. Disdaining an ordinary grave, which had been dug for the King in the floor of the chapel, they found a vault in the centre of the quire, containing two coffins, believed to be those of Henry VIII and his queen Jane Seymour; and there his coffin was placed, with no ceremony beyond the tears of the mourners, the Funeral Service being then under prohibition. The words 'King Charles, 1648,' inscribed on the outside of the outer wooden coffin, alone marked the remains of the unfortunate monarch. These sad rites were paid at three in the afternoon of the 19th of February, three weeks after the execution. The coffin of King Charles was seen in the reign of William III, on the vault being opened to receive one of the Princess Anne's children. It remained unobserved, forgotten, and a matter of doubt for upwards of a century thereafter, till, in 1813, the vault had once more to be opened for the funeral of the Duchess of Brunswick. On the 1st of April, the day after the interment of that princess, the Prince Regent, the Duke of Cumberland, the Dean of Windsor, Sir Harry Halford, and two other gentlemen assembled at the vault, while a search was made for the remains of King Charles. The leaden coffin, with the inscription, was soon found, and partially opened, when the body of the decapitated king was found tolerably entire and in good condition, amidst the gums and resins which had been employed in preserving it. The first Lord Holland used to relate, with some pleasantry, a usage of his father, Sir Stephen Fox, which proves the superstitious veneration in which the Tories held the memory of Charles I. During the whole of the 30th of January, the wainscot of the house used to be hung with black, and no meal of any sort was allowed till after midnight. This attempt at rendering the day melancholy by fasting had a directly contrary effect on the children; for the housekeeper, apprehensive that they might suffer from so long an abstinence from food, used to give the little folks clandestinely as many comfits and sweet-meats as they could eat, and Sir Stephen's intended feast was looked to by the younger part of the family as a holiday and diversion.-Correspondence of C. J. Fox, edited by Earl Russell. 'Sir, for a descendant of the great Oliver Cromwell, it is humiliation sufficient to be employed, as I am, in pinning up the tail of your sister! '-Rede's Anecdotes, 1799. Which, if not stand- was brand- alum magnatum. And in coal-holes their ribbons hide and garters. From this statement it appears that the author's friend, though a Whig, had no personal knowledge of the club. The slanderous rumour about Milton may be passed over as unworthy of notice, this untrustworthy tract being the only authority for it. But the author of the Secret History has more evidence to produce. 'where an axe was hung up in the clubroom, and was reverenced as a principal symbol in this diabolical sacrament. Their bill of fare was a large dish of calves'-heads, dressed several ways, by which they represented the king, and his friends who had suffered in his cause; a large pike with a small one in his mouth, as an emblem of tyranny; a large cod's head, by which they pretended to represent the person of the king singly; a boar's head, with an apple in its mouth, to represent the king. . . . After the repast was over, one of their elders presented an Ikon Basilike, which was with great solemnity burned upon the table, whilst the anthems were singing. After this, another produced Milton's Defensio Populi Anglicani, upon which all laid their hands, and made a protestation, in form of an oath, for ever to stand by and maintain the same. The company wholly consisted of Ana-baptists,' &c.
And sent him to his fellows. Lowndes mentions another edition published in 1716. Hearne tells us that on the 30th January 1706-7, some young men in All Souls' College, Oxford, dined together at twelve o'clock, and amused themselves with cutting off the heads of a number of woodcocks, 'in contempt of the memory of the blessed martyr.' They had tried to get calves'-heads, but the cook refused to dress them. MEMORIALS OF CHARLES I It is pleasanter to contemplate the feelings of tenderness and veneration than those of contempt and anger. We experience a relief in turning from the coarse doings of the Calves'-Head Club, to look on the affectionate grief of those who, on however fallacious grounds, mourned for the royal martyr. It is understood that there were seven mourning rings distributed among the more intimate friends of the unfortunate king, and one of them was latterly in the possession of Horace Walpole at Strawberry Hill, being a gift to him from Lady Murray Elliott. The stone presents the profile of the king in miniature. On the obverse of this, within, is a death's head, surmounting a crown, with a crown of glory above; flanked by the words, GLORIA-VANITAS; while round the interior runs the legend, Gloria Ang Emigravit, Ja. the 30, 1648. There are also extant several examples of a small silver case or locket, in the form of a heart, which may be presumed each to have been suspended near the heart of some devoted and tearful loyalist. In the example here presented, there is an engraved profile head of the king within, opposite to which, on the inside of the lid, is inscribed, 'Prepared be to follow me, C.R.' On one of the exterior sides is a heart stuck through with arrows, and the legend, 'I live and dy in loyaltye.' On the other exterior side is an eye dropping tears, surmounted by 'Quis temperet a lacrymis, January 30, 1648.' Other examples of this mourning locket have slight variations in the ornaments and legends. What is a club? A voluntary association of persons for a common object, and contributing equally to a common purse. The etymology of the word is a puzzle. Some derive it from the Anglo-Saxon cleofan, to cleave, q. d. the members 'stick together;' but this seems a little farfetched. Others consider it as from the Welsh verb clapiaw, to form into a lump; or to join together for a common end. Whencesoever our name for it, the institution is ancient; it was known among the ancient Greeks, every member contributing his share of the expenses. They had even their benefit-clubs, with a common chest, and monthly payments for the benefit of 'members in distress. Our Anglo-Saxon fore-fathers had like confederations, only they called them gylds or guilds, from gytdan, to pay, to contribute a share. From an early period in the 18th century, the amusements of the inhabitants of Manchester consisted of cards, balls, theatrical performances, and concerts. About 1720 a wealthy lady named Madam Drake, who kept one of the three or four private carriages then existing in the town, refused to conform to the new-fashioned beverages of tea and coffee; so that, whenever she made an afternoon's visit, her friends presented her with that to which she had been accustomed,-a tankard of ale and a pipe of tobacco! The usual entertainment at gentlemen's houses at that period included wet and dry sweetmeats, different sorts of cake and gingerbread, apples, or other fruits of the season, and a variety of lime-made wines, the manufacture of which was a great point with all good housewives. They made an essential part of all feasts, and were brought forth when the London or Bristol dealers came down to settle their accounts with the Manchester manufacturers, and to give orders. A young manufacturer about this time, having a valuable customer to sup with him, sent to the tavern for a pint of foreign wine, which next morning furnished a subject for the sarcastic remarks of all his neighbours. Within that time the old servant, Molly, came in with mop and bucket, and the representative for Lancashire and his friends retired in dismay before this prototype of Dame Partington. After this eight o'clock law was established, John Shaw's was more than ever resorted to. Some of the elderly gentlemen, of regular habits, and perhaps of more leisure than their juniors, used to meet there at four o'clock in the after-noon, which they called 'watering time,' to spend each his sixpence, and then go home to tea with their wives and families about five o'clock. But from seven to eight o'clock in the evening was the hour of high 'change at John Shaw's; for then all the frequenters of the house had had tea, had finished the labours of the day, closed their mills, warehouses, places of business, and were free to enjoy a social hour. Tradition says that the punch brewed by John Shaw was something very delicious. In mixing it, he used a long-shanked silver table-spoon, like a modern gravy-spoon; which, for convenience, he carried in a side pocket, like that in which a carpenter carries his two-foot rule. Punch was usually served in small bowls (that is, less than the 'crown bowls' of later days) of two sizes and prices; a shilling bowl being termed 'a P of punch,'-'a Q of punch' denoting a sixpenny bowl. The origin of these slang names is unknown. Can it have any reference to the old saying - Mind your P's and Q's.? If a gentleman came alone and found none to join him, he called for 'a Q.' If two or more joined, they called for 'a P;' but seldom more was spent than about 6d. per head. Though eccentric and austere, John won the respect and esteem of his customers, by his strict integrity and steadfast adherence to his rules. For his excellent regulation as to the hour of closing, he is said to have frequently received the thanks of the ladies of Manchester, whose male friends were thus induced to return home early and sober. At length this nightly meeting of friends and acquaintances at John Shaw's grew into an organized club, of a convivial character, bearing his name. Its objects were not political; yet, John and his guests being all of the same political party, there was sufficient unanimity among them to preserve harmony and concord. John's roof sheltered none but stout, thorough-going Tories of the old school, genuine 'Church and King' men; nay, even 'rank Jacobites.' If perchance, from ignorance of the character of the house, any unhappy Whig, any unfortunate partisan of the house of Hanover, any known member of a dissenting conventicle, strayed into John Shaw's, he found himself in a worse position than that of a solitary wasp in a beehive. The club possesses amongst its relics oil paintings of John Shaw and his maid Molly, and of several presidents of past years. A. few years ago, a singular old China punch-bowl, which had been the property of John Shaw himself, was restored to the club as its rightful property, by the descendant of a trustee. It is a barrel-shaped vessel, suspended as on a stillage, with a metal tap at one end, whence to draw the liquor; which it received through a large opening or bung-hole. Besides assembling every evening, winter and summer, between five and eight o'clock, a few of the members dine together every Saturday at 2 p.m.; and they have still an annual dinner, when old friends and members drink old wine, toast old toasts, tell old stories, or 'fight their battles o'er again.' Such is John Shaw's club-nearly a century and a quarter old, in the year of grace 1862. From a punch-drinking club we turn to a dining club. About the year 1806 a few Manchester gentlemen were in the habit of dining together, as at an ordinary, at what was called 'Old Froggatt's,' the Unicorn Inn, Church-street, High-street. They chiefly consisted of young Manchester merchants and tradesmen, just commencing business and keen in its pursuit, with some of their country customers. They rushed into the house, about one o'clock, ate a fourpenny pie, drank a glass of ale, and rushed off again to 'change and to business. At length it begun to be thought that they might just as well dine off a joint; and this was arranged with host and hostess, each diner paying a penny for cooking and twopence for catering and providing. The meal, however, continued to be performed with wonderful dispatch, and one of the traditionary stories of the society is that, a member one day, coming five minutes behind the hour, and casting a hasty glance through the window as he approached, said disappointedly to a friend, 'I need not go in-all their necks are up! 'As soon as dinner was over, Old Froggatt was accustomed to bring in the dinner bill, in somewhat primitive fashion. Instead of the elegant, engraved form of more modern times, setting forth how many 'ports,' 'sherries,' 'brandies,' 'gins,' and 'cigars,' had been swallowed or consumed,-Froggatt's record was in humble chalk, marked upon the loose, unhinged lid of that useful ark in old cookery, the salt-box. A practical joke perpetrated one day on this cretaceous account, and more fitted for ears of fifty years ago than those now existing, led to a practice which is still kept up of giving as the first toast after every Tuesday's dinner at the club, 'The Salt-box lid,'-a cabala which usually causes great perplexity to the uninitiated guest. About Christmas 1810, these gentlemen agreed to form themselves into a regular club. Having to dine in a hurry and hastily to return to business, the whole thing had much the character of every one scrambling for what he could get; and the late Mr. Jonathan Peel, a cousin of the first Sir Robert, and one of its earliest members, gave it in joke the name of the 'Scramble Club,' which was felt to be so appropriate, that it was at once adopted for the club's title, and it has borne the name ever since. The chief rule of the club was, that every member should spend sixpence in drink for the good of the house; and the law was specially levelled against those 'sober-sides' who would otherwise have sneaked off with a good dinner, washed down with no stronger potations than could be supplied by the pump of the Unicorn. 'The ladies of the Toughey [? Toffy] Club were rather disappointed at not receiving, by the hands of the respectable messenger, despatched by the still more respectable members, of the Oyster Club, a few oysters. They are just sitting down, after the fatigues of the evening, and take the liberty of reminding the worthy members of the Oyster Club, that oysters were not made for man alone. The ladies have sent to the venerable president a small quantity of sweets [? pieces of Everton toffy] to be distributed, as he in his wisdom shall think fit. Will never presume with their stations to quarrel. And we all shall be better and happier fellows. And have something to lend, and to spend, and to give. His vocal shell for oyster barrel. And give the French the shell. Such were and are some of the Convivial Clubs of Lancashire in the last or present century. Doubtless, similar institutions have existed, and may still exist, in other counties of England. If so, let some of their Secretaries, Recorders, or Rhymesmiths tell in turn their tale. J. H.